Cats are completely different than dogs. They are much more sensitive to toxins than dogs, and using “less” of a product doesn’t make it safe. Not even if the dog is in the same weight span as the cat. Many flea control products for dogs also contain substances harmful to cats – even products made for spraying on bedding, furniture, and similar. Always read the label. 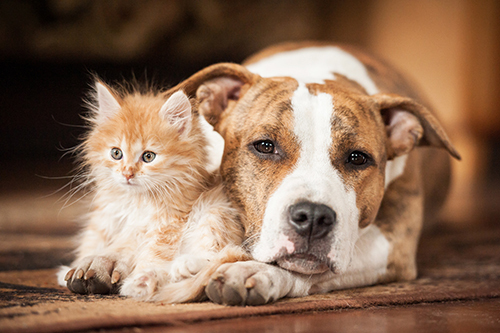 In a household with both dogs and cats, it is a good idea to keep them separated after applying flea control products to the dog – the product isn’t safe until it’s dry, and keeping the pets separated will protect your kitty from accidental exposure. Cats are also much more sensitive to citrus extract products than dogs. These extracts are often found in shampoos, dips, sprays, and insect repellents. Citrus extracts can be fatal to cats, even in low doses. When you give your cat a flea treatment – spot on, pill, or anything else – keep an eye on them. If they show any unusual behaviors such as drooling, losing coordination, stumbling, or similar, wash the cat and rinse with a lot of water. Then, call your veterinarian or closest Pet ER immediately for a check-up and treatment.